Christmas with all its affluent excesses is now behind us and we settle back to normal life. The Bible story tells how the baby Jesus was rushed to Egypt as a refugee from the murderous despotic king Herod - so much for mankind then and now! While 2018 was a record year for people needing help at The Larder, 2014 was very similar - needs don't seem to change as much as one would expect. Thanks to your generosity in the run up to Christmas, we now have more reserves than ever before, so are well placed to support whatever is needed in 2019. Donations always drop off after the Harvest Festivals and Christmas, so please don't imagine the job is "done"!! Whatever crisis people face, being hungry doesn't assist a response to the problem. But getting easy food hand-outs does not help people to face their problems. They may need expert help to challenge a ruling after Benefits are curtailed, or help confronting an addiction; there are as many reasons as we have clients! Of course there are people we suspect of "taking advantage". We are conscious of our responsibility to donors who expect us to give food only to people who truly need it. The referring agencies help to establish the correct balance. More worrying are people who do not come to us for whatever reason but who do have a real "food emergency". No-one should be embarrassed at coming to ask for help; the time to feel embarrassed is failing to give something back when life returns to normal. A happy New Year to all, with kindness and compassion throughout! Charity is the greatest of the "three things that last: faith, hope and charity" taken from recent Bible readings in churches using the Lectionary. Charity is often translated better as "love"; both words convey a variety of ideas, but taken together they focus on giving and on caring for others. In The Larder we certainly rely on our donors care and concern in what is given for people in need. But "HOPE" should not be overlooked. The Open Door Centre, CAB (Citizens' Advice Bureau) and others help to get people to a better footing in life - which gives Hope. In fact we insist that clients do get support for their underlying problems. EDDC (East Devon District Council) also give very positive help. The EDDC offices in Exmouth Town Hall are open 5 days per week which saves travel to the Exeter Job Centre. Staff are not just looking at benefit issues but also discretionary housing payments, money advice, identifying if clients qualify for any other benefits and also making links with other services. The Exeter Job Centre went live with Universal Credit in September 2018 and there is an EDDC Officer on the spot to help local clients. It is brilliant to report that our local council and its staff can be numbered amongst those who are giving HOPE - possible light at the end of the tunnel for people who are hungry and worrying about how to feed the children. The Christmas and winter months are always busy so it is too early to say we have an increase in demand, but we are certainly very busy at the moment. Reports of Anthony's full retirement are premature, management of the Community Larder now falls to a Leadership Team, with Noel as team leader on Monday and Ian on Friday. At the recent annual gathering Anthony received a presentation for his 6 years as manager, but also a hard hat to symbolise the role of Warehouse Manager! The reality is a hard working team of dedicated volunteers, all working together to make it work; acting as intermediaries between the generosity of the community and the needs of people who are in a hole. The Mayor was also at the gathering, receiving Larder thanks for the generosity of the community and also expressing appreciation for what The Community Larder does. The truth is that we are fulfilling different roles, but we are all in it together, giving charity, love and caring to people who badly need hope! Demand has increased substantially. November, December and January are always busy, but this year February has continued with a very high level of need. Most noticably the number of people served has jumped, because of more large families in need. A increased proportion of clients are suffering problems with Benefits, either payment delays, not receiving as much as expected or finding that the Benefit has been swallowed by repaying a loan. Our task is to provide basic food when it is really needed, leaving the referring agencies, CAB, EDDC, Open Door and others to help sort out the benefit problems. As usual, we also have people with surprise troubles; partners who take the money but leave the children and many other variations! No-one is going to handle things positively when hungry or with unfed children, so The Larder leaves the issues to the referring agencies and simply supplies provisions - and also tea, coffee and a safe place to discuss the way forward. Meanwhile, our donors continue to provide as generously as ever - but the need may become more acute. .....but tinned meats, tinned vegetables (peas, carrots and sweetcorn), tinned fruit, rice pudding and custard are especially welcome. There are collection points in many churches, in the Magnolia Centre Co-op, Tesco and elsewhere. THANKS to you all - as always! NOTE graph will update to latest info after March 2019! Society has changed. In years gone by, local neighbours would have helped people in trouble; saving for a rainy day was normal. Advertising now encourages us to use credit cards and loans to acquire more and more stuff and so stimulate "the economy". More cars and stuff are good for the economy, but not always for the planet. Extended borrowing risks a crisis when a steady income is disrupted! 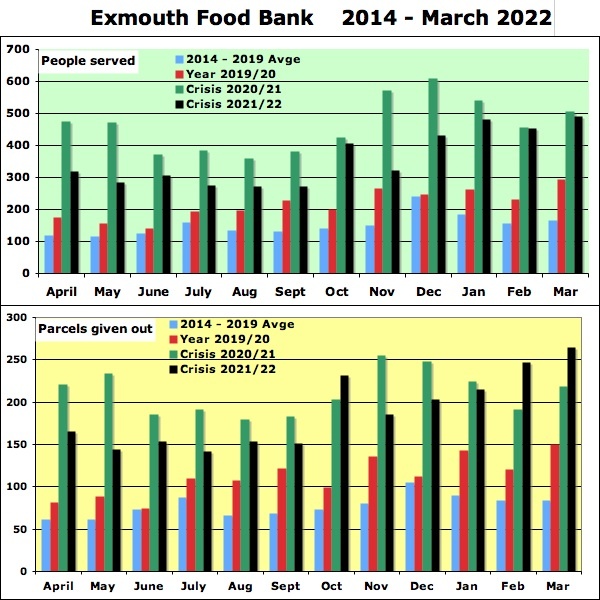 The part that used to be played by neighbours helping within each locality is now played by the whole community, so a big THANK YOU to the whole of the Exmouth area for continuing to support the help which the Exmouth Community Larder is able to pass on. An increased proportion of the clients referred to The Larder by agencies have Benefit problems, but as always there are people with surprise troubles - a partner who has taken the car and the money but left the children! Or people for whom everything was running well until a sudden injury or illness has left them without the expected income, but with long term commitments for TV services, car leases and the like. In the week when the Notre Dame in Paris burns down after 850 years, we are all reminded that things which seem permanent can suddenly disappear. Thanks also to the many churches, to Tesco, the Co-op and many others who provide convenient collecting points for donations. We should also remember the staff in CAB, EDDC, the Open Door Centre and others who work to help disadvantaged people and help them find the path to get back on top. All our own staffing is by unpaid volunteers; all money donations go directly to the support of clients - mainly to buy items to fill gaps on our shelves.... we do have lots of Beans, Soup, Pasta and Tuna which are always popular donations - but we also need tinned fruit, rice pudding or custard, pasta sauce, long life milk and tinned meat dishes. Everything is dated to keep a good stock rotation, so our reserves are not out of date! Now in our seventh year, we have a good team of volunteers on Mondays and another good team on Fridays. However, new volunteers are very welcome, otherwise the average age will get older and older....and older....! !